The governor of Reniets (a land far, far away!) is known to be very stingy. He has to build a road which connects all the five cities in the region, which are oddly arranged on the vertices of a regular pentagon (see the picture below). Building a road is very expensive: the longer it is, the more it costs! His first idea is to build five roads, each connecting a city to the center of the pentagon, then he realizes that it might not be optimal. In fact, he remembers that, years ago, his friend had to connect four towers, and the solution wasn't trivial!. How long is the shortest path that connects all the five cities? assume that the side is long $1$ km. I currently don't know the solution, I will accept the most convincing answer if no proof is given after some days. 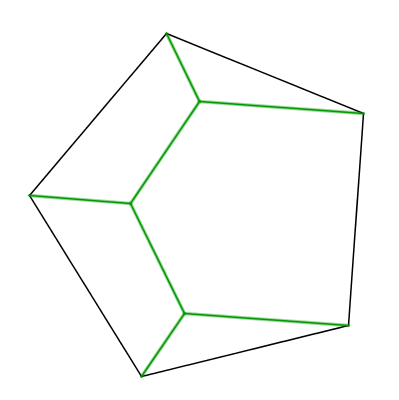 If you can generalize the solution to polygons of any number $n$ of sides, I will award a bounty (the amount depends on the quality of the work). As the only Steiner tree for this set of five points, it is the only locally minimal solution, hence it must be globally minimal. For regular hexagons and above, just take the perimeter and remove one edge. EDIT: Whoops I forgot to calculate the total path length. Brb. Not the answer you're looking for? Browse other questions tagged mathematics story optimization graph-theory or ask your own question. What Road and What Story? Can the idiot's route be less expensive than the genius' route?